Spanish IT contractor Indra, SELEX Galileo, FLIR Systems and Airborne Technologies are equipping an Italian built, light twin aircraft to perform maritime surveillance. 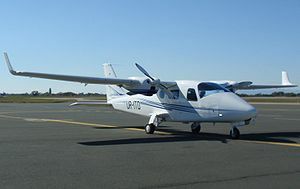 In its civilian form, the Tecnam P2006 is the lightest certified twin engine aircraft sold in the US. It has two 98 HP engines that can run on either AvGas or premium auto-gas. The four seat is about the size and price of a Cessna 172. Fuel burn is less than 10 gal. per hour. An ability to search up to 40,000 sq miles (e.g. 200×200) on a single sortie is claimed. This might be thought of as an alternative to UAVs. This entry was posted in News and tagged MPA, UAS, UAV by Chuck Hill. Bookmark the permalink.